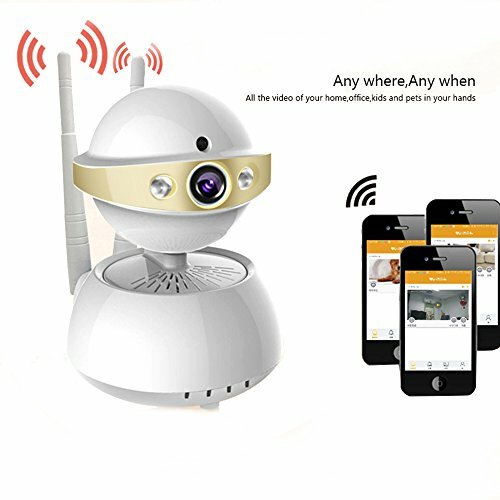 EASY TO PLACE & USE: Quick install and setup this wireless surveillance camera, just connected with your phone or computer device in minutes, using the View App (\"LiveYes\").The home security camera can be accessed via iOS/Android mobile Phone, Windows PC and Apple Mac Software and web browsers. TWO WAY AUDIO: This IP camera built in microphone and speakers so you can talk and listen to your family or friend via home wireless cameras. Supporting video recording up to micro SD card 64GB (Kindly notice here:This packaging is not included the micro SD card). This baby monitor also have Intelligent Motion Alerts feature, you can receive Message Alerts/Snapshots from Mobile App to ensure well being. NIGHT VISION: Remotely talk and listen via mobile App even in the dark with the IR LED night vision up to 20 feet. This home surveillance gives you good protection in pitch dark, you can see the whole room via night vision - not just a limited spotlight view at anytime of day or night. It also can be used for shops, meeting room, pets,nanny, elder monitor. FULLY FUNCTIONAL AT: The 720P High Resolution lens provide you with the best image & video recording quality. Using it for video recording, fast forward and playback via local micro SD card. Move the security IP camera as you wished horizontal angle 355 degree and vertical degree 100 let you monitor every corner under the camera. FRIENDLY CUSTOMER SERVICE: If your home security system have any problem, please contact us. we will give you our best service and solve all your problems.